The first time I went to this market wasn’t actually planned. It was on a Sunday and I was meeting a friend who lives outside Barcelona and would arrive by train at Estacion Francia. I was early and bored with the thought that I had to wait here. But when I got closer by, I saw people sitting on the entrance stairs, drinking beer and having fun. 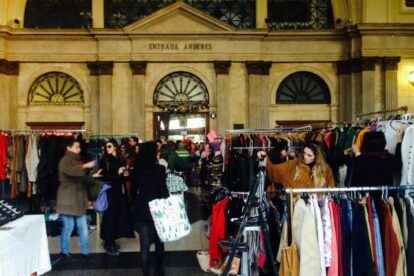 Then I entered the station hall, which had been transformed into a gigantic vintage market! There was a DJ, bars with beer and vermut and it seemed like I had just joined a fun party! There are many stands selling vintage clothes. Some of them more professional, others are just selling what they want to get rid of from their own closets. People can subscribe and rent a stand so it is a nice mix. In summertime the market is located at the beach. I bought a beer and start strolling around the market. The first item that caught my eye was a suede fringe jacket. I tried it on and it fit perfectly. I bought it and put it on immediately. Then I had to find my friend between all the vintage lovers. We found each other by surprise, standing next to each other at a fur coats stand. So we started trying them on, had some more beers and it became a perfect Sunday. On weekends, but not on a regular basis, so check the website for dates and location.